China's leaders continue to worry about the country's economy. The rest of the world should too. On Wednesday, China's central bank weakened its currency. It set the reference rate for the yuan at the lowest level in five years. The actual cut was small: only about 0.3%. It didn't send world markets into a downward spiral like in August, when China devalued its currency by nearly 2%, or in early January, when it cut by about 0.5%. Nevertheless, it's a warning sign. The reference rate is the level that the People's Bank of China sets each day, although the yuan is allowed to trade in a range around that price. "Whether China stress reemerges is a key unknown," wrote the economics team at Deutsche Bank Research Wednesday. China's Communist Party still claims the country is growing 6.5% to 7% a year. Capital Economics, among other independent forecasters, believes the real number is 4.2%. Some believe China's latest currency move was to get ahead of a Federal Reserve interest rate hike, which will probably make the U.S. dollar even stronger. Others point to a slew of ho-hum economic data from China. The bottom line is: the chiefs of the world's No. 2 economy are still on edge. There appears to a power struggle going on between China's top leaders on what to do next. 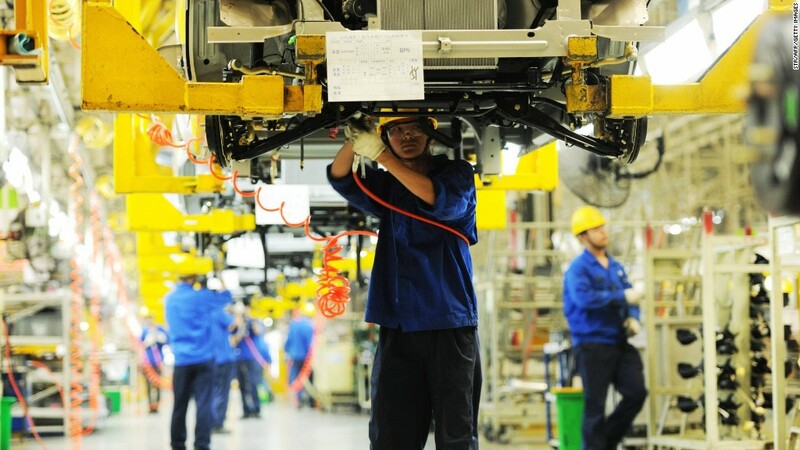 Does the Chinese economy need more stimulus spending or not? It's a big question at a time when the world is also wondering what the Fed will do. Wall Street and the press have followed the Fed's every breath with papparazzi-like intensity. There's about a 50-50 chance the Fed will hike interest rates in June or July. But for all the scrutiny over the Fed, it would be a mistake to ignore the equally mixed signals coming from policymakers in Beijing. State investment jumped in early 2016, helping to ease global concerns of a "hard landing." At one point, global investors got so giddy about Beijing coming to the rescue that global commodity prices rallied. But there are signs Beijing is tapering off. "I think China's leaders are bewildered. There seems to be a power struggle going on there," says economist Ed Yardeni, president of Yardeni Research. President Xi Jinping sounds like he's ready to halt stimulus spending. His latest statements in China's state press sound a lot more concerned with pushing through reforms, especially in the bloated state sector. In contrast, China's other key leader -- Premier Li Keqiang -- appeared focused on maintaining growth near 7% in his remarks in at the National People's Congress in March. On top of the slowdown, China faces two bigger problems: debt is piling up, and the country is trying to make the very tricky transition from an economy that makes a lot of cheap stuff to one that relies more on its own middle and upper classes buying the goods and services it produces. This is new territory for China. President Xi and other leaders are clearly experimenting. The result has been a year of yo-yo economic policies. What comes next -- and how that impacts the rest of the world -- isn't clear. 1. How much more stimulus will China do? More would likely be good for the global economy, but too much could backfire. Investors might read it as panic. If there really is a power struggle between President Xi and Premier Li over how much more money to pump into the economy, the leaders might turn to devaluing the currency instead to try to boost exports and growth. China's vow last summer to allow the yuan to trade more freely seems to be on hold. 2. Can President Xi push through reforms? Just because the Chinese economy seems to have avoided a "hard landing" doesn't mean it's really on better ground. The state economy is still a large crutch. State firms have to be allowed to fail, says Mark Williams of Capital Economics, and banks have to acknowledge their bad debts. 3. Will China's debt bubble burst? 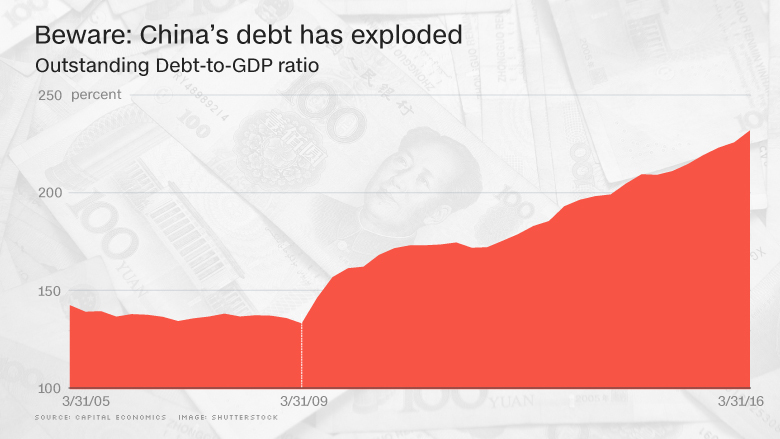 China's debt has exploded. Outstanding debt as a percentage of GDP went from about 150% in 2009 to nearly 240% in March 2016, according to Capital Economics. The debt isn't likely to be a huge factor in the coming months, but it's another mess for Beijing to sort out down the road.